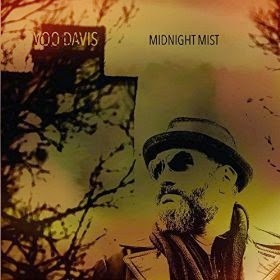 I just received the newest release, Midnight Mist, from Voo Davis and it's hitting on all 12 cylinders! Opening with When I Get Back To You, Davis is on track and laying down an easy to love melody along the lines of the early Doobies but with flashing hot guitar riffs poking from north, south, east and west. Nicely crafted, Davis' multiple guitar lines compliments themselves and the track nicely and his vocals are great as always. Title track Midnight Mist, is strongly melodic with clean articulate acoustic guitar work. Strong slide guitar work from Davis highlights this track with it's almost Marshall Tucker or John Mayer like warmth. My Love hammers it's way out of the gate with a driving guitar (Davis) and drum (Craig Borchers)combo topped with hot harp work from Calvin Conway. This is exactly what I liked about Voo Davis the first time I heard him. Strong, stripped down in your face blues rock. Excellent! Cajun Sun has an infectious guitar rhythm and Louisiana rhythm with hot slide riffs over the top. Very nice! Riverside Blues is a soothing track with a catchy melody. It's super how Davis can take a simple melody, sing his guts out and rip quietly behind the scene on his slide without making it overbearing... a very cool quality. Southern funk infused Low Hangin' Fruit has a great groove. Davis' vocals on this track are some of the best on the release teased along by Conway and Davis in addition to resonator work hits Lowell George flavored slide work on electric. Excellent! Howling Out Your Name is the most highly produced track on the release reminding me of some of the tracks done by Plant and Page in 1969 (without the hindrance of Plant's annoying vocals). Find Me A Backbone has a real raw country blues feel with wound out electric guitar sounds and rudimentary drum beats. This is a simple but possibly the coolest track on the release. Excellent! Nothing Changed At All is a nicely crafted track with a smooth sophistication. Music In The Streets has a quick funky tempo with a really slick guitar lead. You Gotta Wait has a strong R&B feel. A well structured track highlighting Davis' soulful vocals and tight drums by Borchers and B3 by Michael Burkart. Davis has great feel for lead guitar and adds just the right amount without making the track feel overburdened. Laughing Out Loud is a simple but nicely executed ballad. A quiet blend of slide guitar, acoustic guitar and vocals makes this a particularly nice track. Void has a feel of early country folk music. With acoustic guitar, piano and vocal accompaniment, this is a track that should see a bit of radio play. You Wanna Know Why almost has a cat Stevens like vocal and a familiar Clapton riff that is repeated throughout the track as garnish. Davis finally cuts loose on his electric guitar for an extended and adventurous guitar solo. A simple rocker this is another track that could easily see broad appeal.